Circumnavigation Page 6 - What did we learn from our first departure/leg of the trip? Let's start with the "mistakes" we made prior to leaving... As explained elsewhere, we had been particularly restricted (financially speaking) throughout 2016 in our ability to quickly and efficiently refit Ngahue IV early on, because the buyer of our HR43 Ngahue III pulled out of the sale of the boat. This left us with the prohibitive upkeep of TWO Hallberg-Rassies! When, to our great relief, our HR43 was finally sold (unfortunately "for a song" as they say, the second time more than 9 months later), we needed to rush through our refit with insufficient time to think about, cross-check and test the new equipment acquired. 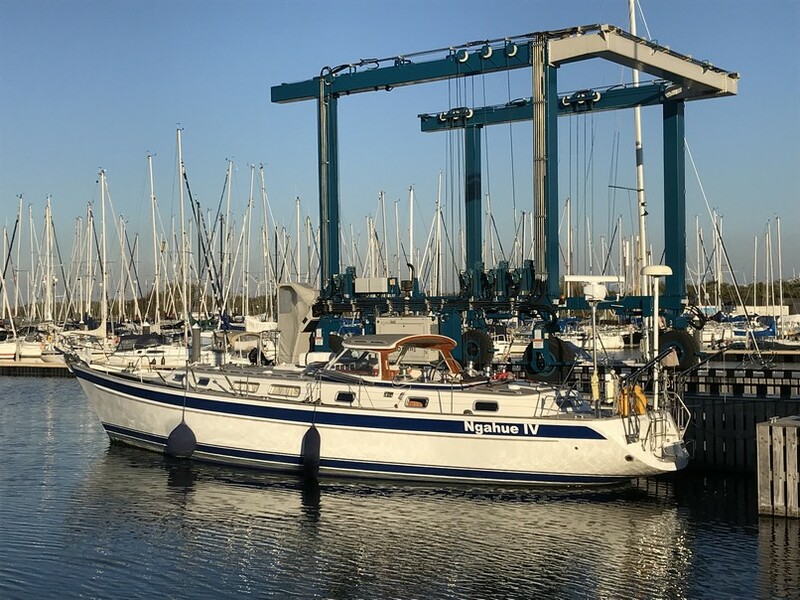 Instead of being able to take our HR53 directly to the Netherlands immediately after the purchase, and let Yachtservice Van Swaay in Bruinisse carry out the whole refit in one go (as I had done very successfully with them in 2013 on the HR43), we were obliged to organise our refit piecemeal, in Germany, and in Belgium (pictured below, Ngahue IV in Dover, and finally, in 2018, in Bruinisse - transformed into a motorboat to fit "inside"). Without pointing any fingers at all, but this situation was of course far from ideal, leading for instance to the rushed decision to replace all electronics in Kiel with a brand that we didn't really know or understand, just because the standing rigging was going to be renewed there anyway. We were impressed by the enthusiasm of the electronics engineer who had been recommended to us and we followed his advice to install all electronics from Furuno, but in hindsight it wasn't the best decision. Certainly the Furuno radar and GPS performed well, but we were extremely disappointed by the FI-70 instruments, all of which have developed some fault or other during the first year or so of use. Further, the Furuno autopilot also turned out to be a COMPLETE DISASTER for us, leading to much frustration as it systematically sent us 30-40° off track and gave rough instructions to our hydraulic drives, causing 12mm stainless steel connector pins with the rudder quadrant to break several times. 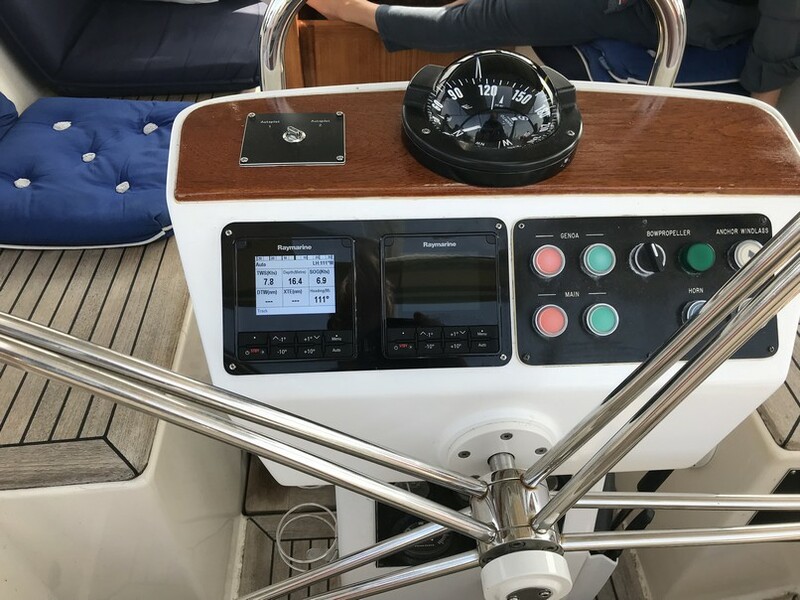 In Bonaire, after we had a new set of breakages, we decided that the Furuno autopilot on our boat was INTRINSICALLY UNSAFE and we decided to return to Europe to have the Furuno replaced by two Raymarine pilots (see picture of pedestal with two Raymarine controllers below). 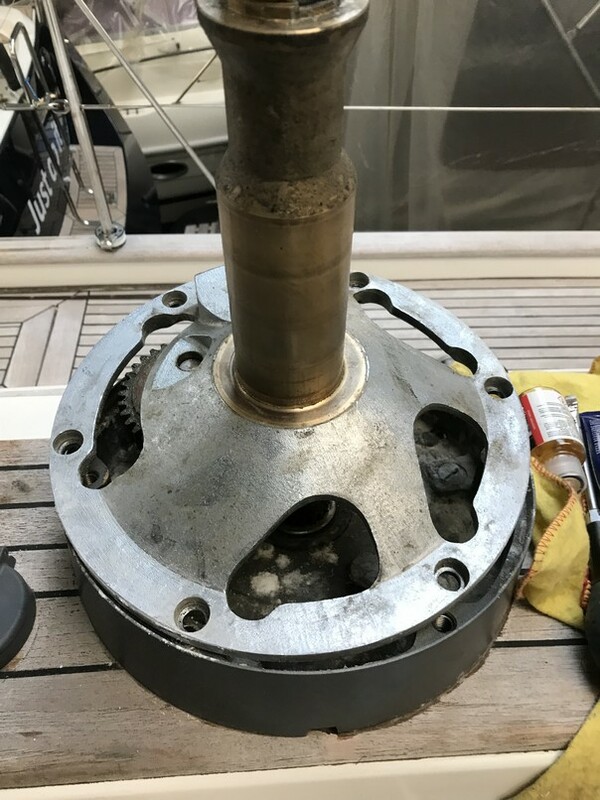 Our Furuno depth, log and water-temperature transducer broke down completely on our return trip, and we needed to enter Bermuda with NO DEPTH information as a consequence. When you look at the Bermuda chart and see all the notices on dangerous rocks and reefs, you will understand our apprehension and lack of kindness for Furuno. At least Furuno sent a replacement transducer to the Azores, where it was replaced. But for instance the Navtex aerial also turned out to be a mess and failed to give an adequate signal to the Navtex set, which only started operating satisfactorily once it was linked up with our RR Pacific aerial in August 2018. Until then, and using the aerial that came with the set, it had a very limited range and displayed more stars (for error messages) than proper text!!! Furuno also seems to not care about what its (sailing) customers think - the response of their after-sales team in Germany has been even more disappointing than the performance of their instruments (and this is an understatement). On the whole trip, our boat never failed to amaze us in a most positive sense and she proved to be a joy to sail! 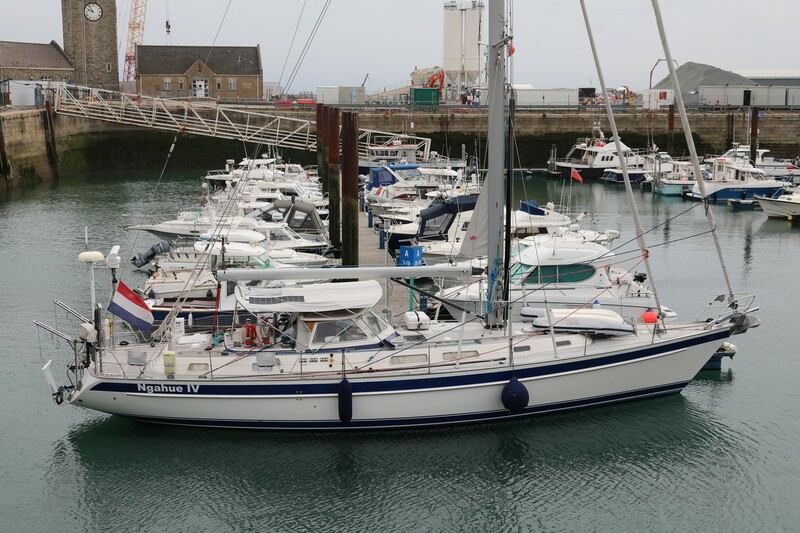 She looked after us at sea as well as in the marina and at anchorages - exactly as the adverts said in the 1990s: "one day you'll be happy it's a Hallberg-Rassy". She may not be the most modern design. Comparable (in length) modern boats have at least one third more space inside. Being just two on board, we're not looking for all that extra space (but can appreciate that other people are, and therefore favour the modern designs). The boat's sea kindly behaviour and the interior lay-out are such that she's very safe, even in a rough sea. OK, so we've added extra hand-holds to the very many that Hallberg-Rassy had already foreseen in 1995. Looking at other and modern boats, there's such an absence of handholds that the chances of you getting thrown around inside are quite high - not good, as President Trump would say! On the "domestic" side, we certainly also benefit from the fact that there were only two persons on board. There are still loads of places where we could store food, water and spare parts. So we are more than amply served on the storage side. We nevertheless remain surprised by the way Hallberg-Rassy gives its freezers so little side and top insulation. 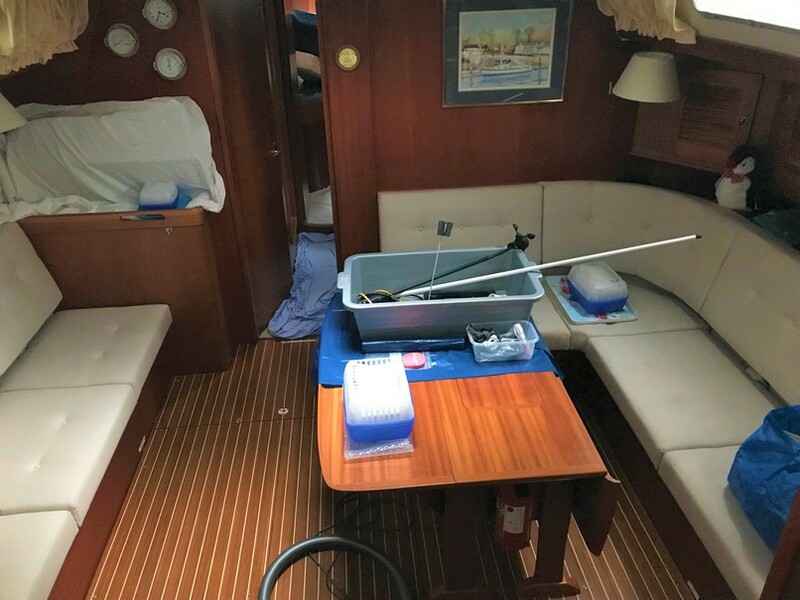 We've solved the problem on our boat with an over-dimensioned sea-water-cooled compressor and cold-plate in the freezer box. The fridge is much and much better insulated; but it is huge to the point that even I - with my long arms - have difficulty in reaching its lowest recesses! Clearly it was designed for use by a Swedish gorilla with XXL arms :-). Laura has come up with special IKEA bags with handles to stow food in these lowest regions of the fridge. Without these tricks, she wouldn't be able to reach that low and get the food out. Although we already had a lot of electricity generating potential on board, we've nevertheless doubled our solar panel capacity and improved the Victron regulator for the panels to get as much electricity out of them as possible. The two additional panels fit on to the bimini in front of the two existing ones (see picture above in Dover, with still only the original two panels on the bimini). Solar is by far our preferred medium these days; the stern of the older HR designs comes up too far for a Watt & Sea hydrogenerator (even the long-arm version we fitted) to be able to remain deep in the water all the time and on both tacks. Also, we sail our boat too slowly to get the full 600W potential out of the Watt & Sea. In his book "Back at the Helm", Arne Martensson, sailing his HR62 Yaghan, underlines the importance of having back-ups to everything. This has always been my approach to off-shore sailing too. 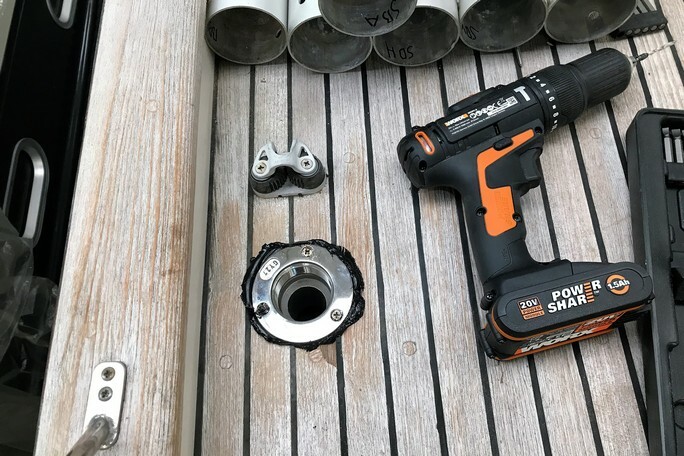 For blue-water sailing, we've now gone a step further and now installed back-ups to back-ups, so that when it really comes to it, we're not dependent on any one system in the boat. Again, one of our advantages is that we're just two persons on board. We should under all circumstances be able to overcome most things thrown at us... This gives us sufficient confidence to set off with a minimum of fuss and worries. The radical solution we opted for regarding our Furuno autopilot was to install two completely new Raymarine EVO-autopilots (see below). The difference between the Raymarine and the Furuno autopilots is PHENOMENAL. 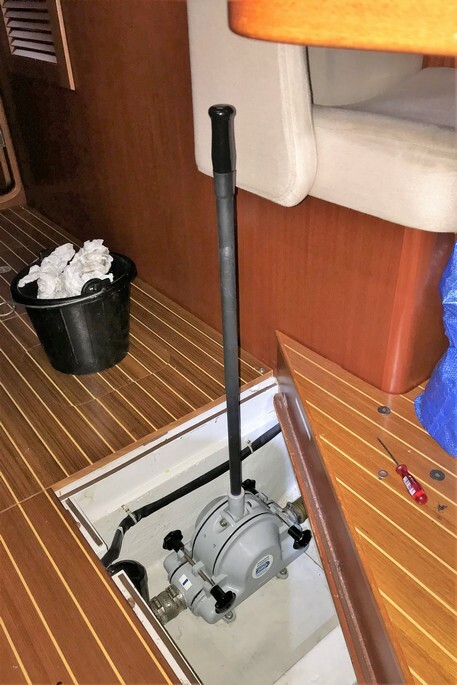 The Simrad-Robertson hydraulic rams now behave in an extremely docile manner and steer the boat beautifully. It's incredible, as our only experience with them so far had been with the Furuno autopilot (see the Technical page with an explanation of how we even had to use bungee cords to calm the wheel!). It's unfortunate how afterwards several people confirmed to us that in their view Furuno autopilots are totally unsuitable for sailing boats. It's a view we can now fully subscribe to; it's a pity that we had to learn this the hard and expensive way... Not only is it a poor product, but, as stated above, we feel extremely badly treated by Furuno's after-sales service. 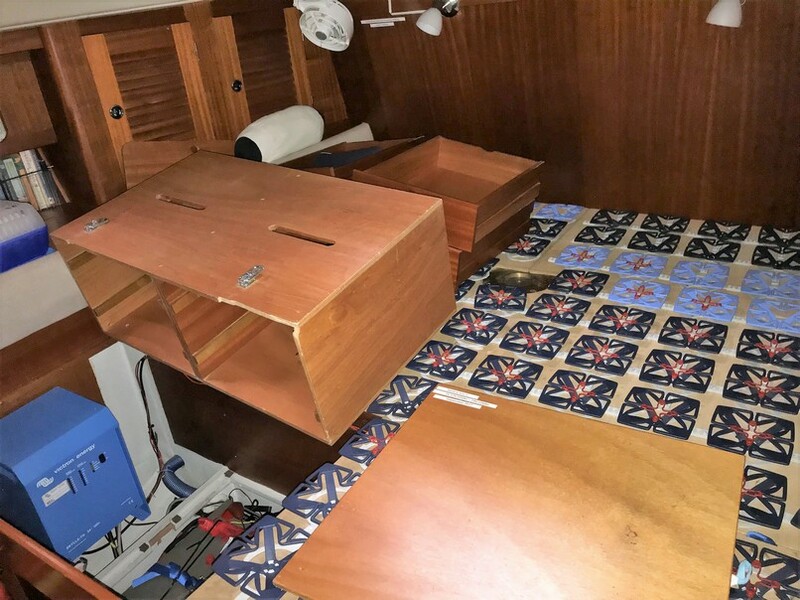 Most of the improvements we've undertaken in Swanwick marina in August 2018 and continued in Bruinisse over the winter 2018-19 (yes, at last we've managed to find our way back to Laurens Van Swaay's Yachtservice Van Swaay there - see picture above) were to modernise the few remaining bits and pieces that weren't changed in 2016-17 and to rectify some issues that we noticed during our Atlantic circuit. For instance, our old High-Output Alternator had at some time in the past been drenched in sea water (a bad hose connection under previous ownership), and the regulator looking after its output had been very strangely wired up by the previous owner as well. 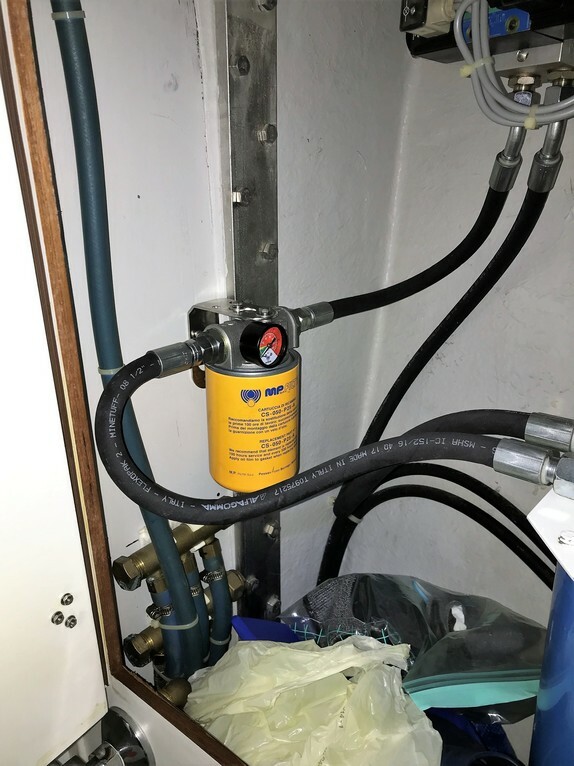 The best solution was to start afresh, so with the help of Maricom in Swanwick marina, there is now a brand new High Output alternator and a brand-new and very high-tech Sterling Power Pro Alt C regulator (with - at last - temperature sensors on the batteries! 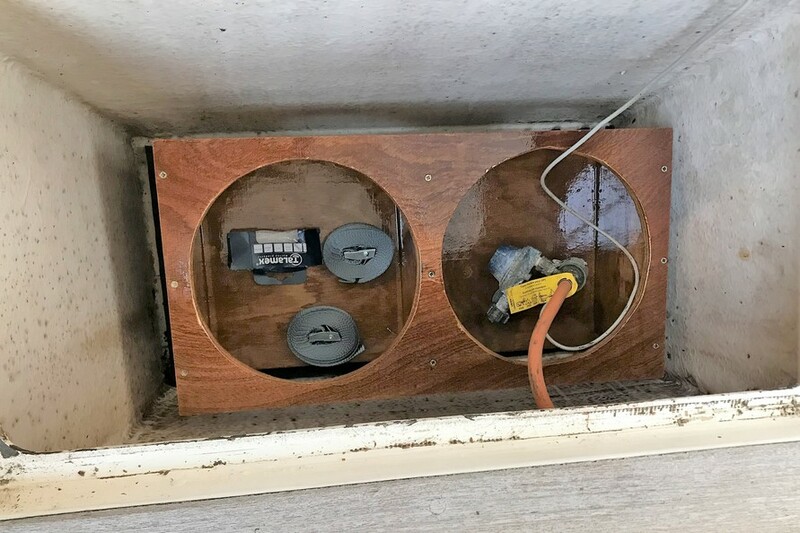 Why had these not been installed by the previous owner, and why had the regulator's external control panel with its audible alarms had been left in the engine room, where they couldn't be seen or heard remains a mystery! 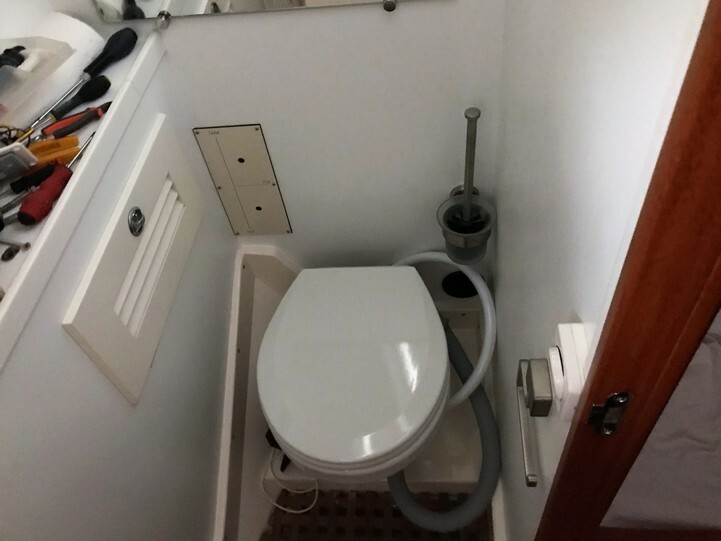 In 1995, the first owner had specified a generator for his boat, but never connected it to any big electricity user (other than probably a washing machine). When we added our AC watermaker, it looked as if the generator and watermaker could share a big, single through-hull & seacock. 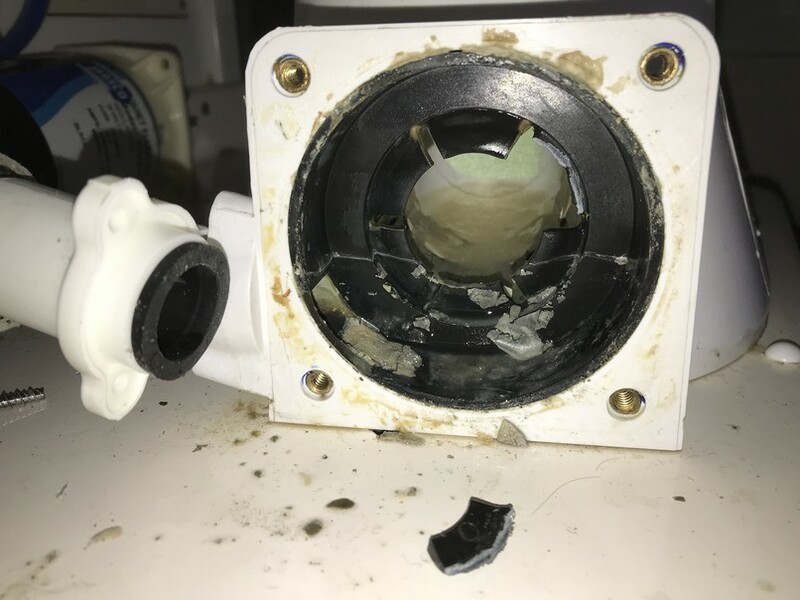 That turned out not to be such a good idea, as the generator didn't get the cooling water it needed after the other users on the same opening had taken their share! We've now decided to separate both big users of seawater and have an extra through-hull openening and seacock for the generator alone. The Candy washing machine broke down in the Caribbean, so it too is being replaced by a slightly smaller model (but with a slightly better track record than the Candy installed by the previous owner - in truth, though: washing machines will suffer in a marine environment, no matter what brand you choose). 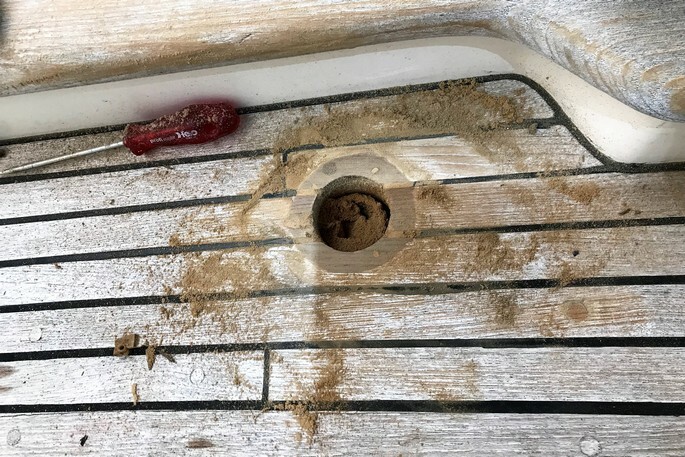 Like many people from a moderate climate who go cruising in the tropics, we were surprised by the toll that the sun and UV take and how quickly equipment wears out by long-term sailing. 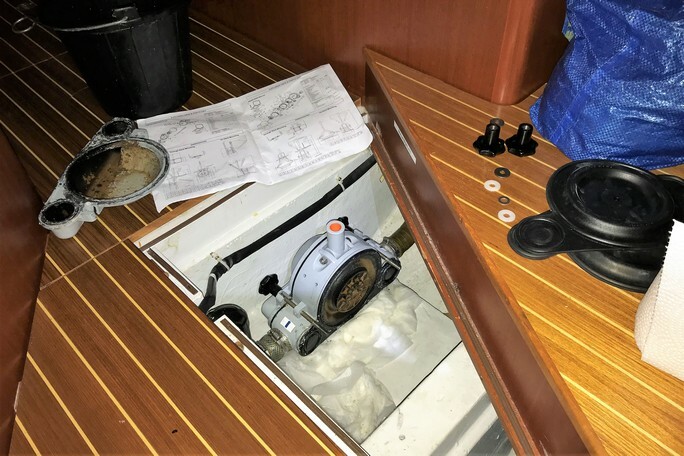 Just look at the 'insides' of our two big e-power winches (see photo above) or the inside parts of our eletric toilet aft (see photo below). But we also have a whole bag full of Blue Performance covers and deck bags that rotted away in just one season under the tropical sun. 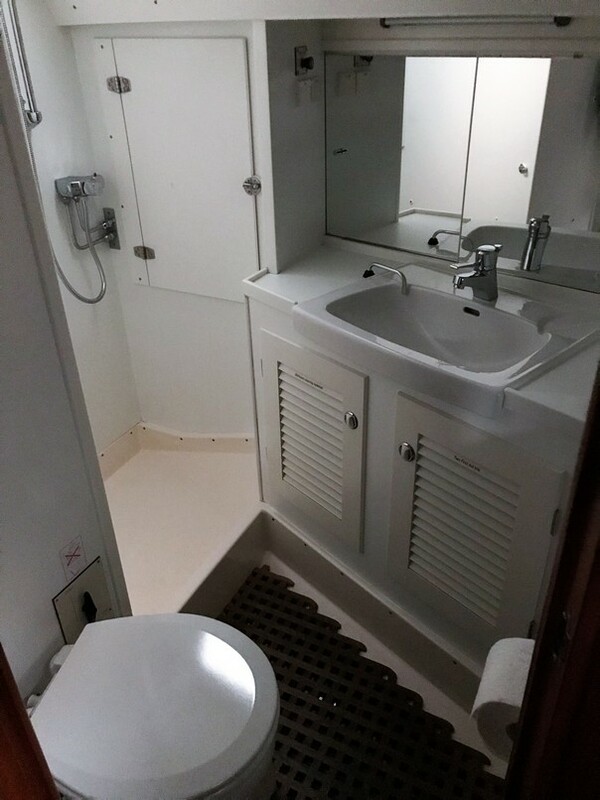 When you think about it, though, we've packed 7 years' sailing into a good year - so when translated back to "European cruising" consitions, the wear and tear on our boat and her equipment is actually quite normal and acceptable. Much of our work this winter is quite simply extended maintenance work, replacement of worn parts, or installing better replacement parts (like a new electric toilet in the forward heads or the inclusion of an oil filter in the hydraulics - this doubles the working life of your hydraulic oil - see photo below - again a mystery as to why it wasn't fitted in the first place, as recommended by Lewmar). Blue Performance also offered us a very good deal on the replacement parts for the sunlight-eaten hatch covers and deck bags. And Air Only ventilators replaced the UV-eaten domes on our deck ventilators. Apparently there was a problem with the chemical formulation of their plastic at one point. Our re-departure looks like taking us on a one and a half year full-time sailing stint until we reach New Zealand late in 2020. 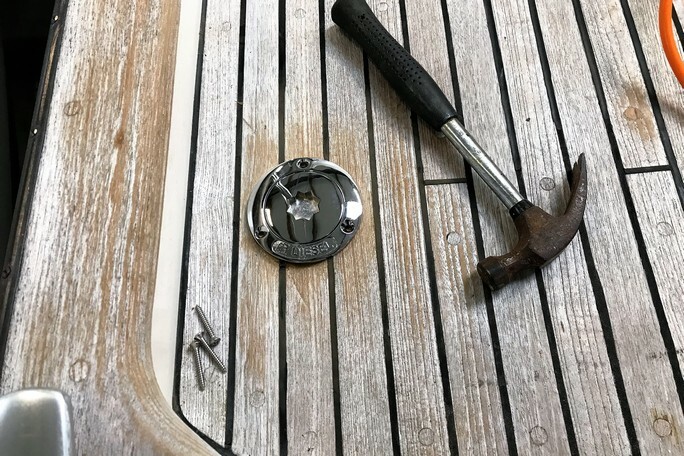 So we're orienting our work towards having as little breakage as possible during that time... We're relying on New-Zealand being a sailing nation to find a decent yard where we can do the maintenance on our boat for the return-to-Europe part of our World ARC trip. We played around with the idea of swapping our Batsystem davits in 2019 for a set of Simpson-Lawrence Series 8 ones. The Batsystem is quite a nifty invention, but it relies too much on a strong pushpit. This is one of the not-so-strong points on our Hallberg-Rassy. Despite double reinforcements, our pushpit still wobbles more than I would like and the tension that the Batsysem pulleys put on the aft balcony tubes when raising or lowering the dinghy is still too much for our peace of mind... Clearly you get what you pay for, and the SL davits are about 2.5 times the price of the Batsystem ones. For coastal sailing they would have been more than acceptable; for ocean sailing there are some limitations, e.g. really needing to put the dinghy on the fore deck (which is good seamanship anyway, so shouldn't necessarily be seen as a downside). They do work, so perhaps with some clever tweaks and adaptations we can stay with the Batsystem in confidence, despite its limitations... The Batsystem guys' at Düsseldorf BOOT 2019 shared some thoughts with us, which we have implemented (in part) since. 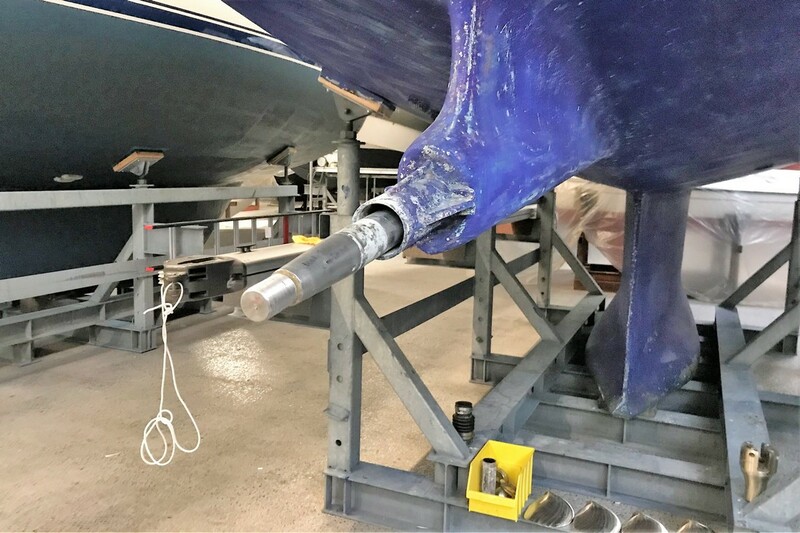 Pictured here some of our December 2018 winter maintenance activities - replacing the last of the original "golden" reading lights originally fitted by Hallberg-Rassy with the models that they use these days. This certainly modernises the "look" and "feel" of our interior. We will also need to clear the saloon to raise the floor (again) to fix the water tank in place. When the boat swings to starboard, the tank emits a "boink" noise that doesn't sound too healthy. 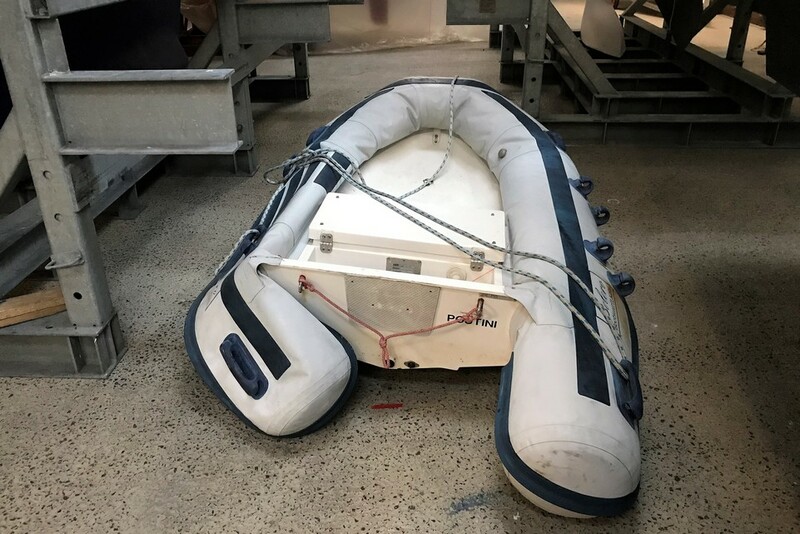 And still to be undertaken, at the time this picture was taken in December 2018, by a specialist yacht interior company is the replacement of all our cushions. That should give the saloon and aft cabin a chique look and feeling again. 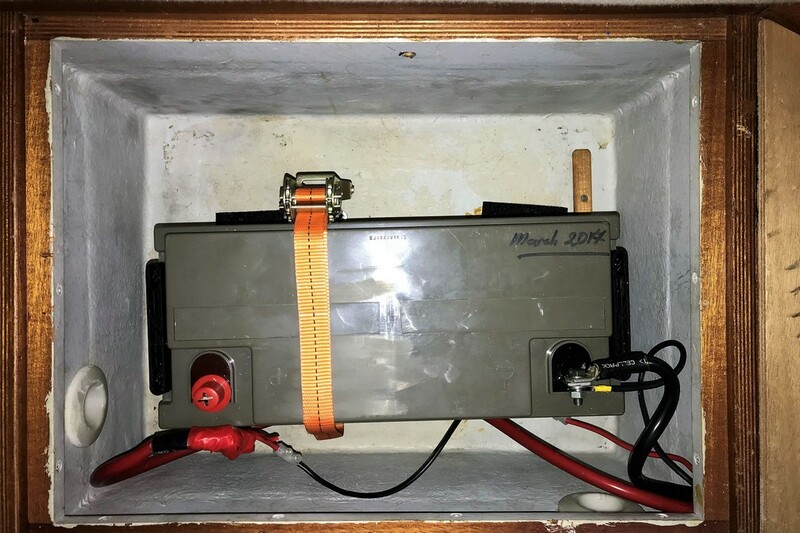 Also the main 24V/100Amp Victron battery charger has developed a fatal internal fault (it doesn't recognise that the batteries are not 100% charged and doesn't charge our three 24V/220Ah battery blocks to their full 100% strength); it was replaced with an identical new unit in the Spring of 2019. Here some other "projects" undertaken: our propshaft seal leaked when you put full power on (which we never did, so the leak was never apparent to us, but it was there, lurking in the background). A new seal has been fitted and appropriate spare parts left on board by Mr Van Swaay. The old gas bottle holder had become so softened and "eaten away" by constant immersion in sea water that it was falling apart. We've made a new holder which fits onto a bed of rubber matting (the kind used for pavements) which will let the sea water drain away harmlessly. A new Truma electrical shut-off valve replaced the old one which was in a sorry state and complete the improvements in the gas locker. 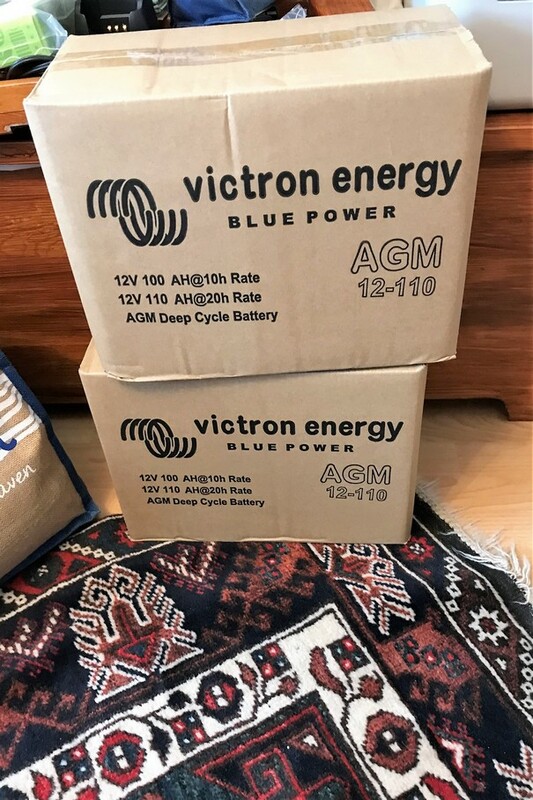 The 12 Volt battery box under the berth in aft cabin is large enough to actually take two 110Ah AGM batteries in parallel, pictured here still in their boxes at home, awaiting to be fitted (each battery weighs in at 32kg!). This will add 70% power to our 12 Volt bank. Basically this bank just starts the engine and generator and opens and closes the 12V Truma gasbottle valve. The bronze protection strips in our entry gates had, with time, come half undone as, the tops of the screws holding them in place had sheared off. New screws, with the strips placed slightly further to the right and the left (to avoid the holes with bits of broken off screws still in them) makes the whole set-up look neat and tidy again. 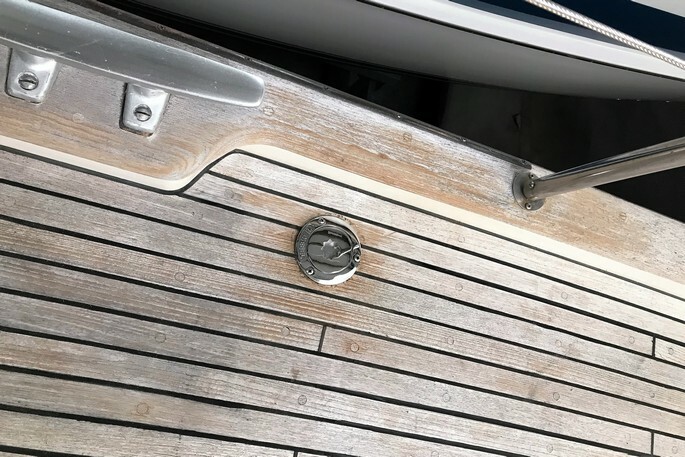 Our deck filler caps had very definitely begun to show their age, so we have replaced these too, as we have also done with the deck shower at the aft bathing platform. 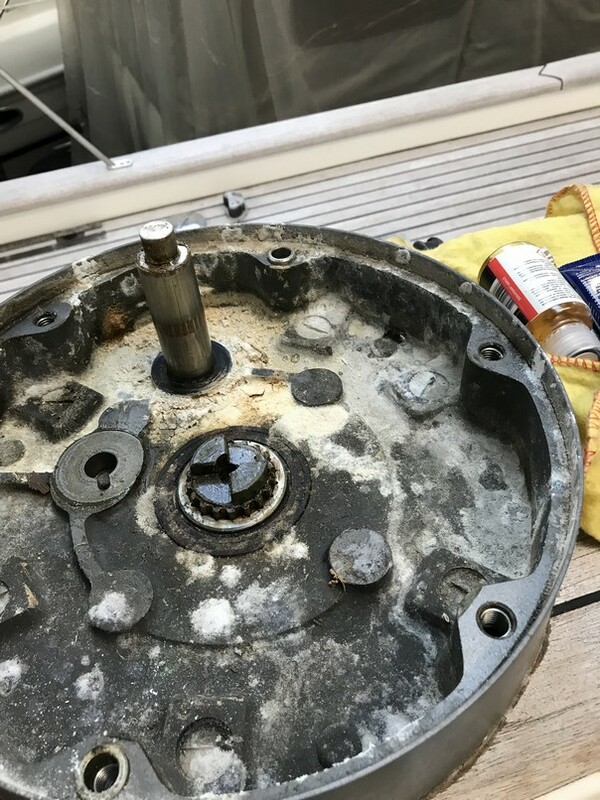 It too had badly corroded over 23 years and leaked on the deck...grrrrrr.... No worries, though as Hallberg-Rassy Parts (Shop Hallberg-Rassy these days) supplies a nearly identical replacement set. Poutini, our dinghy (for more on the story of Poutini, see the Presenting Ngahue page) steadily deflates. Its manufacturer, Pischel in Troisdorf (near Cologne), Germany, sells the little rubber seals that make the valves completely airtight again. They also sold us a special liquid cleaner/polish, so Poutini is looking shiny and new again for our re-departure in 2019. Having carried out these improvements, we discovered that air still leaked from one of its chambers. A quick repair with a patch glued in the appropriate place remedied that issue. Laura has made protective covers for Poutini - something that's quite common in the tropics to protect the tubes from UV. Even Hypalon suffers from degradation when exposed too long to tropical sunlight! 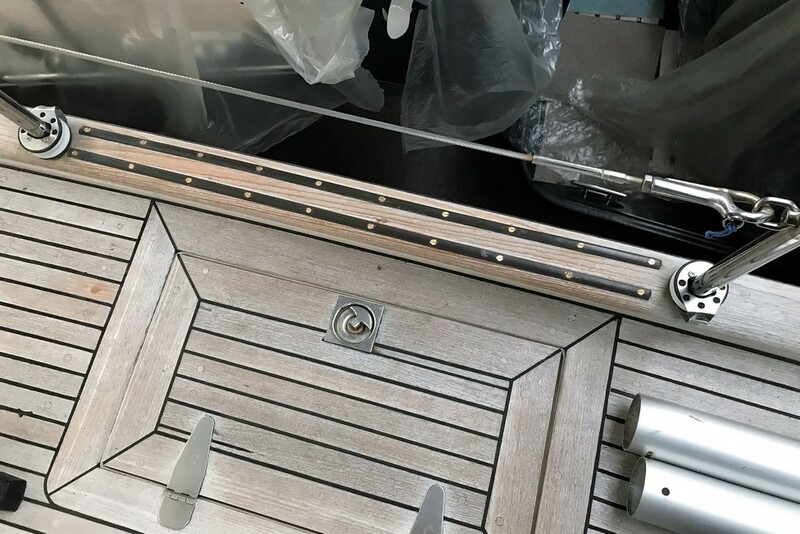 Just a quick run of 4 pictures showing each stage of replacing the deck filler caps - and replacing the membranes in our Jabsco manual bilge pump: a double action Warrior model, which for the ARC is of course in the wrong place -> to qualify for the ARC, it should be in the cockpit and not below deck... Fortunately the ARC knows this is an issue and Rassies can still participate. A week later, I also renewed the membrane on the main electric bilge pump that is situated in the engine room. For thie first half of 2019, we have created a sperate "2019 photos" page in the Photogalleries section. When we leave Bruinisse for our second departure - foreseen for late July 2019 - our circumnavigation story will continue on page 7.